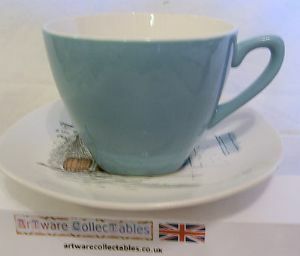 An excellent opportunity to acquire one or more Cups and Saucers from the Cannes series manufactured by the Midwinter Pottery. This Saucer measures just over 5.5 inches (14.5 cms) in length with a similar width. The Cup has a top diameter of 3.5 inches (9cms). Currently, there are 4 Cup & Sau cer S ets available though this offer is for ONE saucer ONL Y. I would be happy to discuss the purchase of more than 1 (until such time as they have all gone) so please contact me . Please note that, although these sauvers are in overall excellent condition, they have been pre-owned. They seem also to be free from all but the very lightest crazing.